I was ready for some lighter reading after a summer of heavy duty 300+ page middle grade monstrosities. A story about Jim Murphy’s sixth grade year at St. Stephen’s Elementary School in 1958 Kearny, New Jersey was the perfect remedy. This semi-autobiographical account depicts the battles with his teacher—a nun who seems to treat young Master Murphy unfairly—and his first crush on a sweet girl. There’s a touch of family life and friendships along with gentle humor often coming from the mouth of Al the Second Grader. Yes, the cover pulled me in first, but the fast moving story had a subtle charm that isn’t realized until Jim uses the banana suit to bring about some good. Not much history of the times, but readers won’t mind with the fun story they’re enjoying. Jimmy Murphy’s sixth grade teacher, Sister Angelica Rose, is out to get him. She humiliates him in class and punishes him when he hasn’t done anything wrong. She even forces him to perform onstage with second-graders, wearing a giant green banana costume. A classic underachiever with a talent for trouble, Jimmy wants revenge, and with his friends he plans a prank that will embarrass Sister Angelica in front of the whole school. What could possibly go wrong? Kids will overlook the nastiness of the plan to harm Sister as it is all done in a silly kid way. We’re talking about a bag of flour here. Friends with nicknames become an important support source for Jimmy. Centi, Mayer, Tom-Tom, Second-grader Al, and Phillip all have distinct personalities and strengths. I wondered what had happened in life to the old gang. New readers rising up from Chapter books would find this to be a good intro to the world of MG. Easy to read and the issues brought forth would be understandable. It takes a village they say to raise a child and Jim has quite the village watching over him. From his parents to his classmate tutor, it all makes Jim a new person by the end. Life for kids was so different sixty years ago. A great read-aloud to provide a comparative discussion between the two eras. The lunchtime meeting didn’t produce any new ideas, although Al the Second Grader was very enthusiastic about attempting to electrocute Angelica or arranging an accidental tumble down a flight of stairs. I thought these possibilities might be worth considering, but Mayor explained that we weren’t trying to injure or kill Sister Angelica. 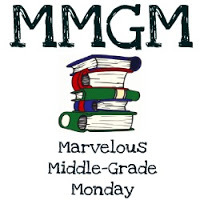 This entry was posted in Reviews and tagged Jim Murphy, male protagonists, Marvelous Middle Grade Monday, MG book reviews, Middle grade, Revenge of the Green Banana. Bookmark the permalink. Interesting that this is based on his life. I’ll have to take a look. Thanks. I can’t think of another MG based on the author’s real life. This sounds like a funny and interesting read. I’m all for light. And I love things set in that era. I’m definitely intrigued by this book. When I first read the title I thought it was about an actual banana XD. Cool that it’s based off of the author’s life! And that the main character has so many people watching over him. Thanks! There is definitely something to be said for short and sweet, at times! Your description had me smiling, so I can only imagine how funny the book must be. 🙂 Happy MMGM, and thanks for the recommend! This sounds like a really fun book to read! I’m curious to know which parts of this book are actually based on the author’s life. Thanks so much for the recommendation! Yeah, what could possibly go wrong? Say that about a book and you have my attention. This looks like a whole lot of fun. I am putting it on my TBR list. Thanks for telling me about it.